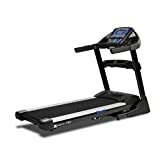 The Xterra Trail Racer 6.8 treadmill is built to perform, with its strong and reliable 3.5 CHP commercial-grade motor made using the highest quality internal parts. This great motor will speed the belt up to 18kph (11.2mph) quickly and efficiently and there are 15 incline levels to choose from. This heavy-duty model is built in the same factory as the range of commercial Spirit Fitness treadmills and highly regarded Sole Fitness ones too, and this Xterra Trail Racer 6.8 provides a great running experience for users. There’s a fantastic cushioning system and 2-ply belt that make your motion smoother as you run on the large sized running area. The LCD display is a 7.5″ widescreen blue backlit high-contrast one and it shows your feedback including calories, distance, incline, speed, pulse and your pace around a 1/4 mile (0.4km) track. You can select one of the 12 pre-programmed workouts on which you can change the intensity so as you improve your fitness level you don’t outgrow the machine. You can set your own tailored workouts using the 2 user-defined programmes and perform the ‘Fitness’ interval training option and the 2 target heart rate (a chest strap is included). The ‘Fitness’ interval training programme is customisable and works by entering your weight and age, choosing your desired top speed and incline and then selecting the number of intervals you want and their duration. The machine will pause to allow you to step off it and recover and perform dumbbell reps or other exercises in-between, before restarting the interval running workout. It’s like having a boot camp in your own home! This feature is a fantastic addition and really takes interval training up a notch (and your fitness too!). Whether you are a beginner or someone who takes their running and training seriously, the Xterra 6.8 treadmill is sure to suit and please.